Garrett Huizing chose to build his second tract of houses in Redlands on Buena Vista starting in 1924. Many of them were Spanish in architecture such as the Langford home. This two-story house has stucco siding and red tile roof. Most of the windows are two-paned with multi panes in each. A large semi-circular focal window is present in the living room in the front of the house, which is typical of a Spanish Revival building. The Redlands Jubilee Book of 1938 tells of Mr. Langford’s accomplishments. “Prominent for half a century in agricultural and commercial interests of San Bernardino valley, Julius D. Langford today is among the front-rank Redlands orange growers. He also owns and operates the Antlers hotel, foremost San Bernardino hostelry.” He was manager of the Crown Jewel association for many years. The second story of this graceful home occupies about two thirds of the building. All around the building are round vents with iron bars. The first story has a medium-gable roof with red clay drains. This roof is the covering for the entrance porch or hall to the front door. To the north of this entrance is a semi-elliptical window. In front of this window is a patio of red and blue tile with a fountain containing the figure of a cherub. The front red tile entry has a semi-circular entrance, with a half-gate of black decorative wrought iron. Two wooden posts with decorative tops support the porch. The front door is of vertical boards with a square glass pane window on top which is covered with decorative ironwork. In 1890, Mr. Langford bought his first orange trees, 2 ½ acres near the Santa Fe Station in Highland and planted oranges. He continued to buy orange property and in 1905 joined with Arthur Gregory, Sr. in laying out 205 acres of oranges in northwest Redlands. In 1909, Langford and Gregory purchased the now famous Carlsbad Caverns in New Mexico. They organized the Carlsbad Guano and Fertilizer Co. with J .D .as president. They shipped guano to their fertilizer plant in Redlands. On the east side of the house is a large balcony on the second story. The balustrade is turned spindles and is supported by large wooden braces. A set of multi-paned doors can be seen in the northwest corner. Its small balcony has similar turned spindles and supportive braces. In the southwest corner is a semi-circular entrance to a south facing stoop, or small patio, of red tile. Semi-circular stucco arches covered with lacy vines lead to a door identical to the front.Ida L. Langford passed away at age 69 on September 29,1936. She was a native of Indiana and lived in Redlands for 33 years. Julius D. passed away March 1,1945 at the age of 77. He was in ill health with a heart ailment and was living in an apartment at his Antlers Hotel. He was born in West Virginia. In 1939, Milton and Gladys Pate, Langford’s daughter, lived in the house. Milton was manager of the Challenge Creamery in San Bernardino. Living in the house in 1947 was William and Constance Silverwood, President of the San Gorgonio Fruit Company, and from 1957 to 1992, Roger and Lucile Robinson. 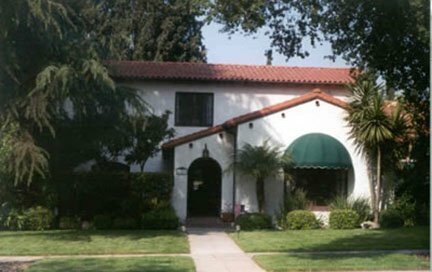 He was a bee keeper and later bookkeeper and Lucile was a teacher in Colton at Mission School and Ontario public schools.The present owners, Dr. Kelly and Madeleine King, purchased the property ftom Ilene O’Connor in 1998. Mrs. King was attracted to the house by its romantic charm. They now have two small children, Dakota and Katie, and are beginning to feel a little snug for room however, the newer homes cannot compare to what they have now. The Redlands Area Historical Society wishes to thank the Kings for their continued care for this lovely property.